The Classic Pro shoe is great for any bowler that wants a durable and budget-friendly shoe. This shoe features an affordable, interchangeable sole (extra soles sold separately). Do these shoes run big? Hello Dodie! From the feedback we have received, this shoe seems to run true to size. Hello. These are for left handed bowlers. And, are they available in right hand? Is there a slide on just 1 shoe or both shoes? Hello Cat! There is a slide on the right shoe and a traction control sole on the left shoe, as this is a left-handed bowlers shoe. Hope this information is helpful! What does left hand mean? If you are a left handed bowler, you will need a left handed shoe. The left shoe will have a traction sole and the right shoe will have a sliding sole. 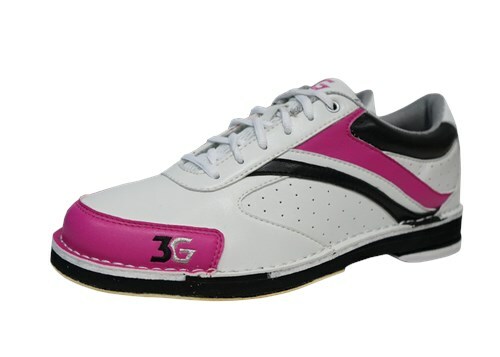 3G is its own company, they do not compare to 900 Global shoes. Do you have size 5?? Yes, we do have a size 5 in this shoe. Yes, that is considered a medium width and we do have this shoe available in a size 10. Due to the time it takes to produce the 3G Womens Classic Pro White/Pink/Black Left Hand ball it will ship in immediately. We cannot ship this ball outside the United States.